New Table Top Single Station Tablet Press Model DP-12. Features: Can produce up to 3,600 tablets per hour depending on the size of tablet and product. Maximum tablet diameter: 12mm, Maximum tablet depth: 15mm, Maximum tablet thickness: 8mm, Maximum Pressure: 4 tons. 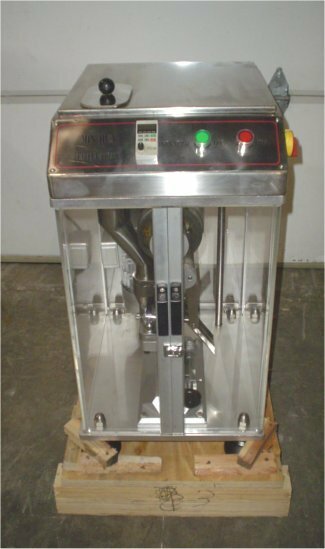 Unit comes completely enclosed in a plastic covering which reduces noise levels, also equipped with stainless steel product hopper and shoe assembly and 1 set of tooling (customer to specify). Equipped with a 1.1kw=1.5HP(1400 RPM) Motor, Electrics: 220Volts/1PH/60HZ, Overall Dimensions: 24”x 20”x34”, Weight 200 Pounds. Delivery 5-7 weeks from receipt of 65% deposit.